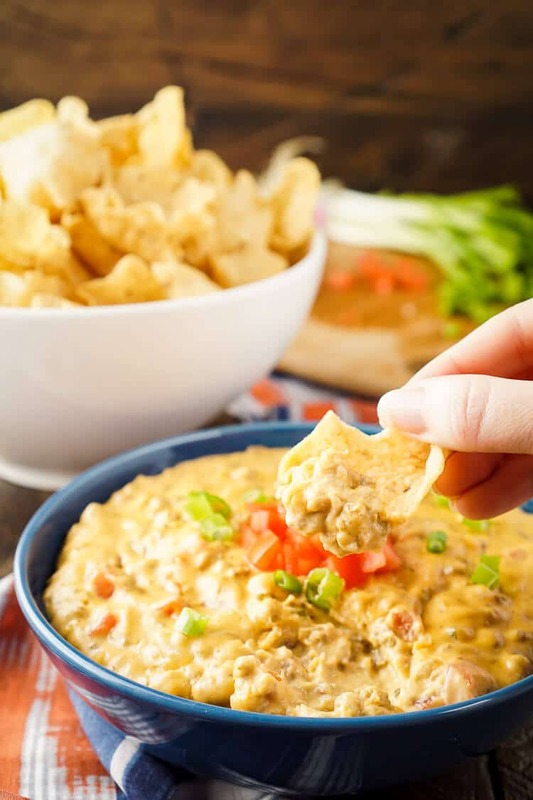 This Cheeseburger Dip tastes just like a Cheeseburger, making it the ultimate game day dip everyone will love! It’s cheesy and addictive and loaded with all of your favorite cheeseburger fixings like relish, tomatoes, ground beef, mustard, and more! Whelp, I made it a whopping week into the new year before I had to post something that was either sweet or cheesy, I have a problem, I know. 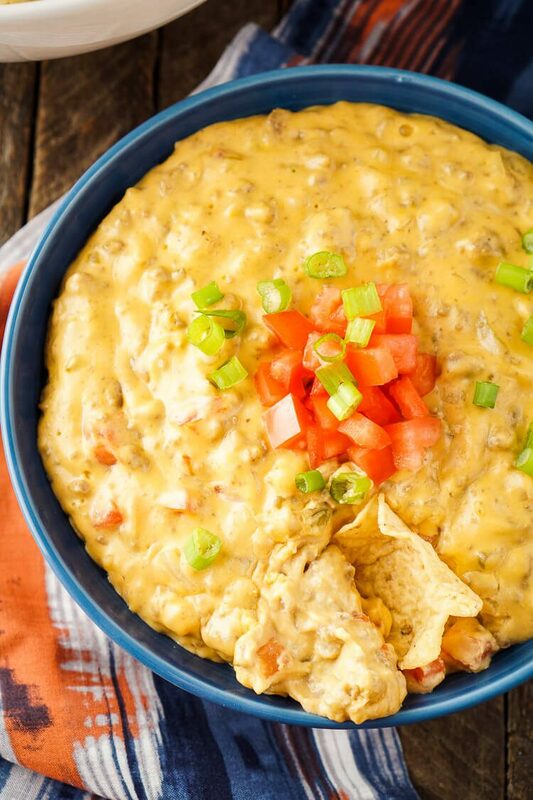 But this Cheeseburger Dip is most definitely the solution! You see, even though a good chunk of you, including myself, are resolving to eat better, it’s still football season and game days call for game day food like wings and dip! You know, the good stuff! This dip tastes exactly like a cheeseburger! Onions, relish, ketchup, tomatoes, and mustard bring all the flavors of a classic burger together and with three different kinds of cheese smothering all of it, what’s not to love!? This makes a good size bowl (or two) of dip, which means it’s great for parties and large groups, plus it reheats great! Oh, and it’s made in one pan in just 30 minutes, who’s winning game days, now? 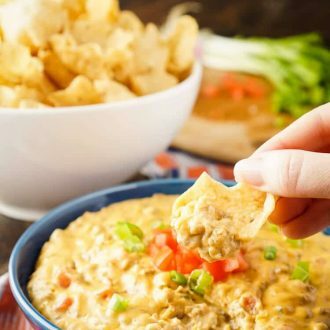 That’s right, this dip, and YOU! 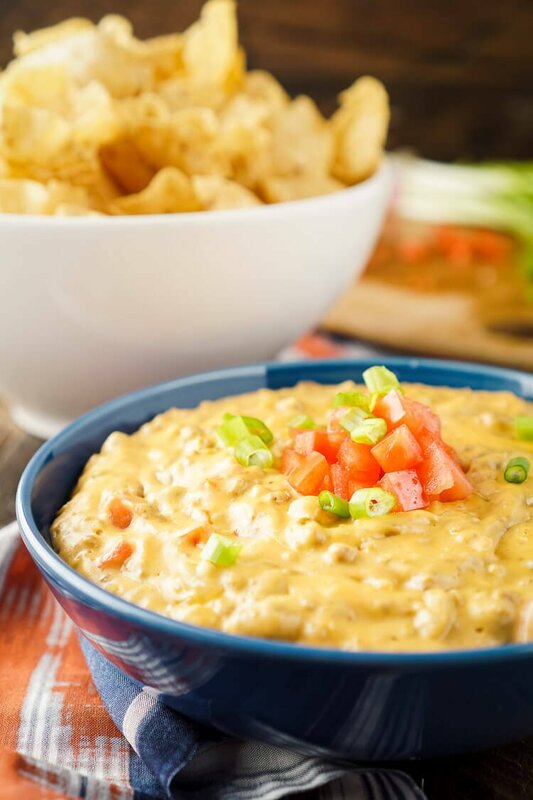 Pin this Cheeseburger Dip for Later! 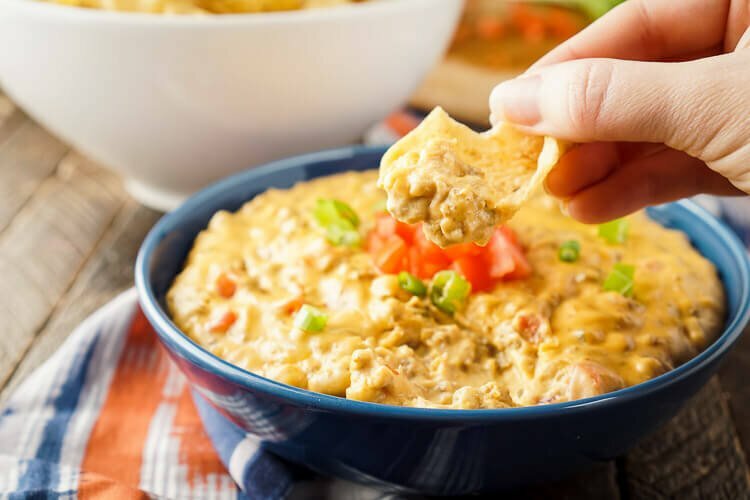 This Cheeseburger Dip tastes just like a Cheeseburger, making it the ultimate game day dip everyone will love! Cook ground beef and onion until beef is completely browned, 7 to 10 minutes; drain in a colander or use a lid to drain the fat. Transfer drained beef back to the pan and season with salt and pepper. Add cream cheese, diced tomatoes, relish, ketchup, mustard, and cayenne pepper to the ground beef and stir occasionally over low/medium heat until cream cheese has melted. Stir in the cheddar cheese until completely melted, then do the same with the mozzarella. Stir in the chicken stock, let simmer for another 5 minutes, then transfer to a serving dish and garnish with diced tomatoes and green onion and serve with tortilla chips. Add 8 strips of chopped, cooked bacon for a bacon cheeseburger dip. WOW, all of these dishes look so yummy, they’re perfect for game night! Thanks, Rosanne, they definitely make game days a lot tastier!